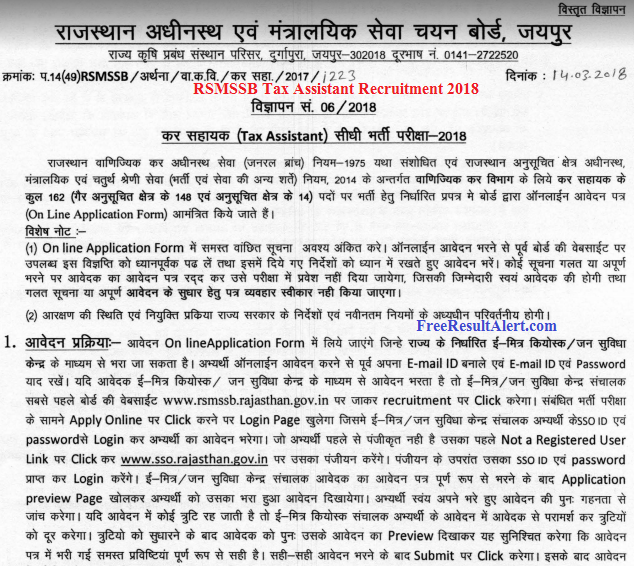 RSMSSB Tax Assistant Recruitment 2018:- Online Rajasthan Kar Sahayak Vacancy Latest News & Download Rajasthan Tax Assistant Notification 2018 PDF From www.rsmssb.rajasthan.gov.in official portal. Rajasthan Subordinate and Ministerial Service Selection Board (RSMSSB) is releasing Bumper Vacancies these days. Now Again it gifted Job Seekers a Great opportunity to Apply for RSMSSB Tax Assistant Recruitment Notification for filling the 162 Posts. The advertisement was released on 14th March 2018 for Latest Vacancy for Rajasthan Kar Sahayak 2018. Students should take the benefit and check here for RSMSSB (Tax Assistant) TA Vacancy Notification and its application process. Now you can apply online for Rajasthan Tax Assistant Bharti online just here before the last date. RSMSSB is going to conduct a written examination to hire suitable candidates. RSMSSB TA Application Form process is going to Starts from 19th April 2018. Candidates should not think twice before Rajasthan Tax Assistant Application Form 2018 Apply Online. The official website will soon Start uploading the application forms. Candidates can Download the RSMSSB tax assistant recruitment 2018 अर्थात कर सहायक vacancy notification from our website by the link given below. Only those who are fulfilling the eligibility criteria are allowed to Apply Online for Rajasthan Tax Recruitment 2018 else the board will reject the RSMSSB kar sahayak vacancies application form 2018 online of candidates. For rsmssb.rajasthan.gov.in notification 2018 for tax assistant, an application fee will be charged from candidates. The details of Tax Assistant Exam Fees Given Below for All Categories. Candidates are guided to not forget to check their Application Status after Filling the Application form. ✹ Educational Qualification:- Candidate must have a bachelor’s degree in any of these Computer Science/ Computer Application/ Computer Engineering/ Electronics or Equivalent. ✹ Age Limit:- Minimum Age must be 18 years for rajasthan 2018 tax assistant vacancy and Maximum Age should be 40. Relaxation will be provided as per Govt. rules. नोट – आरएसएमएसएसबी के कर सहायक अर्थात टैक्स असिस्टेंट के रिक्रूटमेंट नोटिफिकेशन से सम्बंधित किसी भी प्रकार की शिकायत अथवा सुझाव के लिए आप निचे कमेंट के माध्यम से हमसे संपर्क कर सकते है हमारी टीम आपकी पूरी सहायता करेगी !! Reach to Official Portal at http://www.rsmssb.rajasthan.gov.in. Scroll Below Down, Click on the Advertisement Recruitment option. There, Find & Select the “Rajasthan RSMSSB Tax Assistant Recruitment 2018 Notification” link. Download the Notification PDF File to your storage. Finally !! Open & Read the Complete Advertisement i.e. RSMSSB Vacancy for Tax Assistant / Kar Sahayak.